Jayne Hardwick came to the zoo profession with a Bachelor’s Degree in public relations and a Master’s Degree in Educational Leadership. Joining the Animal Behavior Management department at the Jacksonville Zoo in 1995, she worked with birds, mammals and reptiles, conditioning and training everything from target training a tortoise, conditioning macaws to accept feather trimming without restraint, and conditioning a Red-tailed hawk to accept talon trimming while standing on a perch. While at Jacksonville, she also assisted in creating their Environmental Enrichment program and chaired the committee as a resource for keepers developing enrichment options for the zoo collection. She went on to the World Bird Sanctuary in St. Louis, Missouri where she supervised free-flight bird shows and worked with native and non-native eagles, hawks, falcons, owls, vultures, parrots, corvids, and a variety of water fowl. 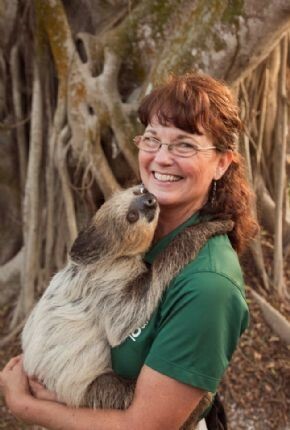 As the Registrar at the Naples Zoo in Naples, Florida, Jayne continued to assist the Show Department by presenting animal shows, training and handling animals. Although her heart belongs to raptors, Jayne has trained Green mambas for husbandry, hawks, vultures and owls for flight, and an African Cape porcupine for presentation in shows. Currently Jayne is Registrar at Nashville Zoo. Are you signed up for the last 2018 Testing Cycle? While you are there check out Amanda’s video, CPBT-KA, working with pelicans on husbandry skills at NC Aquarium at Pine Knoll Shores. The two female pelicans in their care, Ray and Charlie, can't be released into the wild so it's important to keep them healthy through enrichment, exercise, and foot checks. Keep up the great work! Groundhog Day is February 2 ... they are the king of burrows! 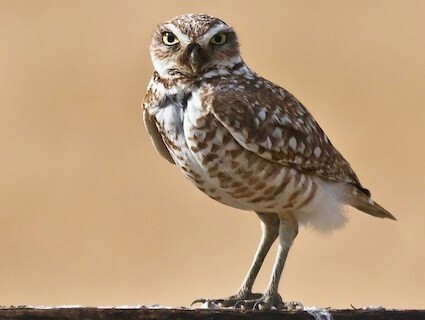 Speaking of burrows…what do you know about burrowing owls? Owls are unmistakable birds, and that goes double for a long-legged owl that hunts on the ground during the day. Burrowing Owls are small, sandy colored owls with bright-yellow eyes. Burrowing Owls live in open habitats with sparse vegetation such as prairie, pastures, desert or shrub steppe, and airports. In parts of their range they are closely associated with prairie dogs and ground squirrels, whose burrows they use for nests. They live underground in burrows they’ve dug themselves or taken over from a prairie dog, ground squirrel, or tortoise. They live in grasslands, deserts, and other open habitats, where they hunt mainly insects and rodents. Unlike most owls in which the female is larger than the male, the sexes of the Burrowing Owl are the same size. Their numbers have declined sharply with human alteration of their habitat and the decline of prairie dogs and ground squirrels. Efforts to protect Burrowing Owl populations can turn into complex ecological juggling acts. On a naval base near San Diego, California, land managers had to balance the needs of declining Burrowing Owls with a colony of endangered Least Terns, whose chicks the owls sometimes preyed upon. According to IUCN they are listed as least Concern This species has an extremely large range, and hence does not approach the thresholds for Vulnerable under the range size criterion (Extent of Occurrence <20,000 km2 combined with a declining or fluctuating range size, habitat extent/quality, or population size and a small number of locations or severe fragmentation). Despite the fact that the population trend appears to be decreasing, the decline is not believed to be sufficiently rapid to approach the thresholds for Vulnerable under the population trend criterion.